May is the time of the year when all Nordic skiers gear up for the new training season, and blog posts about their spring adventures start rolling in. Of course, as I spent my April in Alaska I had the opportunity to travel near and far for some great experiences. 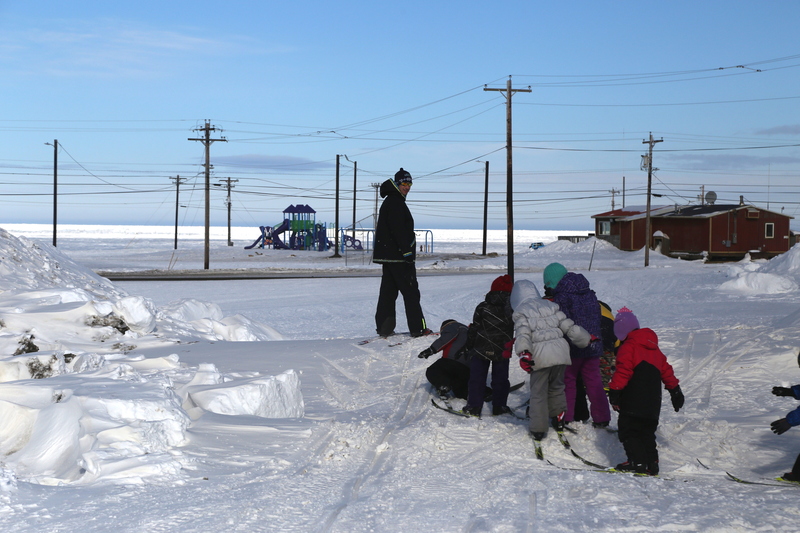 One major experience stuck out: my participation as a coach for Skiku, an Alaskan nonprofit that brings elite skiers into Alaska Native villages to teach children how to cross country ski. 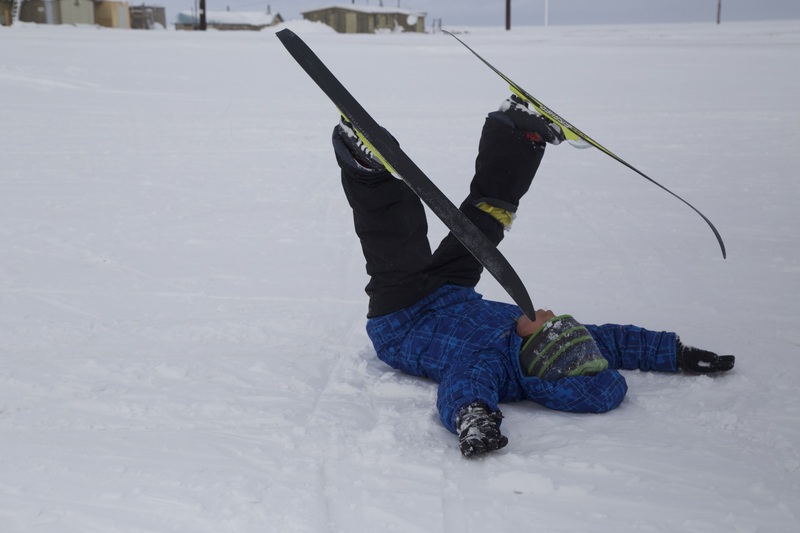 With my Skiku group, I traveled to Wainwright, Alaska, smack dab in the middle of the North Slop. Wainwright is the furthest North I have ever been, sitting at the 70.6° N latitude. Our travel to Wainwright consisted of three flights: Anchorage to Prudhoe Bay, Prudhoe Bay to Barrow and Barrow to Wainwright. Wainwright felt like culture shock equal or greater to international travel. The villagers spoke English (mixed with words from their native language: Inupiat), their school system operated like any American school, and the town companies and industries were American; however, the environment the town exists in can only be described as bizarre and unique. I felt as if a plane dropped me off in the middle of frozen Lake Superior, complete with sandy snowdrifts, headwinds in every direction, and white as far as the eye could see, void of anything to break the horizon. As the only way to travel in and out of the village is by air or snowmobile, it was the most isolated I have ever felt in my life. 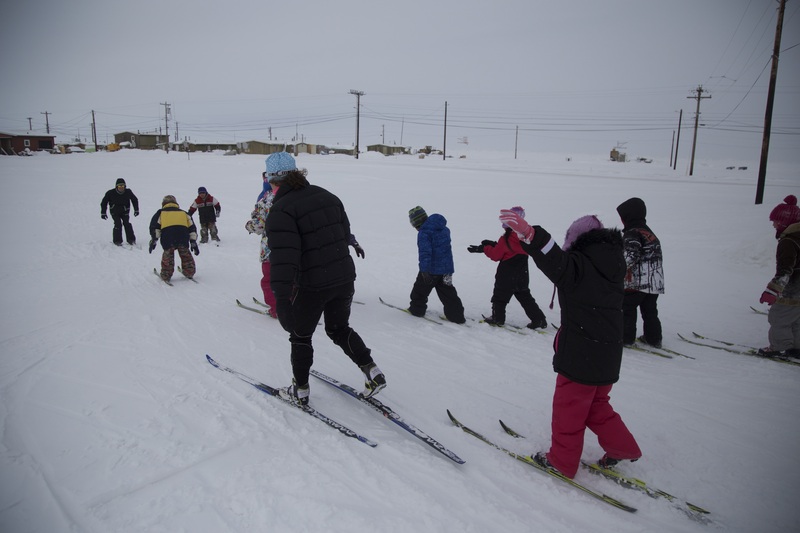 My group members and I immediately started to reach out to villagers and children to get them excited to ski. We participated in the town’s Spring Festival, a yearly event to send off whaling crews for their annual hunt. We attended an intense Baptist Church service, and we made friends with some of the village elders. Skiku schedules the North Slope village trips late in April to allow for warmer weather conditions, but the cold (around 0 degree in the morning to as high as upper 20s in the afternoon) still felt bitterly cold with a strong Arctic wind howling down on us. The kids complained about the “heat”, often shedding their jackets and hats to ski around in only a T-shirt, quite different from my usual five to six layers of bundling. As I expected from hearing stories of other village experiences, the kids’ excitement about skiing could not be matched. Due to the geographical isolation of many Alaska Native villages, new activities or town guests cause quite the uproar (in the most positive way). Our 70 pairs of boots and skis were all checked out after-school and often times we had about 40 kids skiing during all hours of school. Not only does Skiku get kids outside and excited about exercise, but it also teaches them lessons of hard work, diligence and how to have fun in their environment. It is loads of fun for coaches too. I spent many of the days laughing (both at and with the kids), and learning some new tricks myself. On the last day, the sun came out and almost the entire school came out skiing or to join in the excitement. I convinced a few kids to do some laps of the school area with me, a track of about 300 meters. One of the kids, Jono, worked with me a few times that week and struggled a bit getting frustrated when he would fall. However that day Jono set out to race me, he was to complete five laps while I did ten. Jono gave me a run for my money during our race, as I narrowly managed to complete my laps before him. Then, right after catching his breath at the end, he started up again. “We’re done Jono, you finished the race”, I yelled after him. “I want to keep going. Come with me”, he called back. And with that we started up again. Jono huffed and puffed along, flinging off his jacket and hat. While sweat poured down his face I told him about long races I had done, including a rather infamous Spring Series 30k on a 1.5k loop. After about an hour of laps (reaching near twenty for both of us now), I told him he might want to take a break. He had started to trip and fall frequently and other kids had begun to pack up and head home for the night. Jono kept trucking. “I want to do twenty-five. Once we reached twenty-six and the clock ticked to six in the evening, I told Jono we would do one more and call it a day. Jono decided we would race this lap and took off as fast as he could. While he fell about five times during the lap, when he finished, he wore a look that many cross country skiers know well: the satisfaction of pushing yourself to a new level. I was amazed at what Jono achieved. With only four days on skis under his belt he skied over eight kilometers and did so motivated completely by himself. This moment was the defining moment of my first Skiku experience. The kids’ excitement and passion to get outside and try something very difficult blew me away, and reminded me of the simple joys of “sliding” down a hill or “flying” off a jump. And the best part: Skiku was only one week of my spring adventures. More updates on incredible experiences, including crust skiing at Hatcher’s Pass, peak bagging around Anchorage and an amazing visit with Molly Burger, are soon to come. ‘Til then, happy start of training to all you skiers out there!